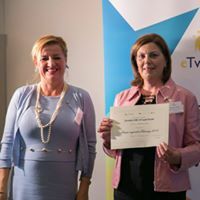 The project was founded as a multilateral eTwinning project with nine partner schools – namely a school in FRANCE, GREECE, PORTUGAL, SPAIN, ITALY, CZECH REPUBLIC, TURKEY, LITHUANIA and LATVIA. 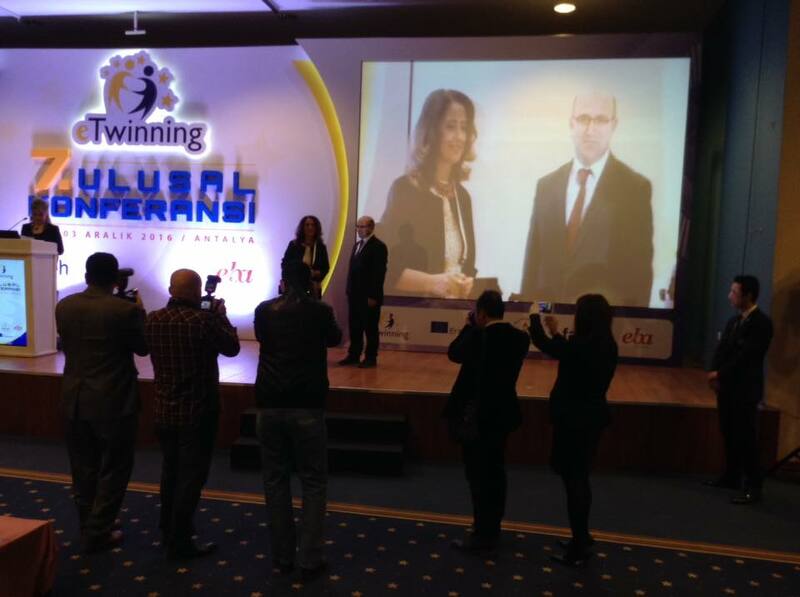 Each of the team introduced themselves, their school and the town - we did it in different ways (e.g. Chinese portraits, Powerpoint presentations), the introductions were accompanied with tasks for partners (e. g. Who is who game), or they were in the form of a task (e.g. the quiz and memory game to introduce the Czech town of Vysoké Mýto). Of course, we did our partners´ tasks and quizzes. Some of the students also edited their personal profiles in the twinspace or wrote a message on a partner ´s wall. The Greek and Czech teams described and shared old customs to wish the project good luck - one with a pomegranate and one with an apple. We also created a project song "What we like is superfoods" - we wrote lyrics, used an old melody, sang it and recorded it. We also wanted a logo for our project, so all the teams started working on the logo drafts. At the early stage of our project, two other important things happened - a common PROJECT BLOG was started by the Greek team and a MAP OF THE PROJECT ACTIVITIES was launched by the French team. By the end of November, we had a lot of beautiful logo drafts uploaded in our twinspace and so each team indicated which logo they liked best (of course they couldn't vote for their own logo) and that way we chose the logo to be used for our project. 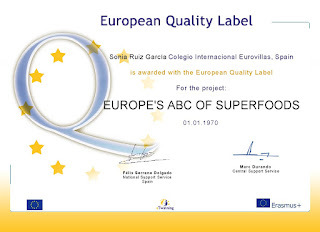 WE STARTED WORKING ON THE PROJECT TOPIC = SUPERFOODS. 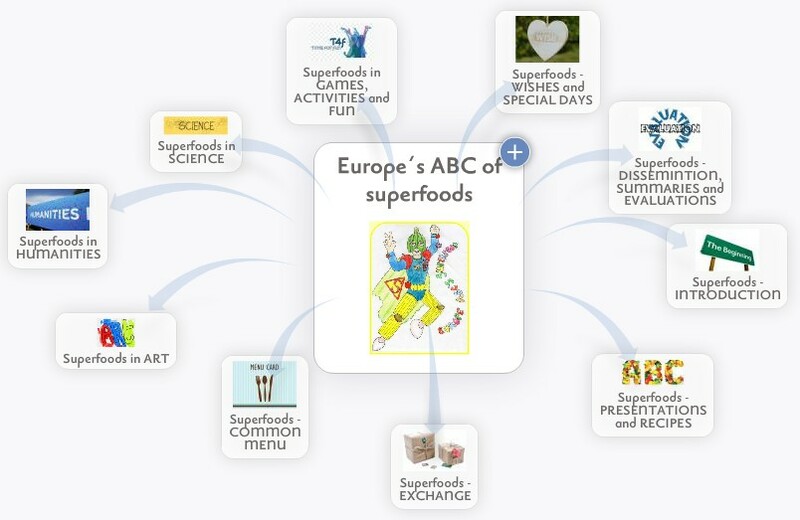 The first step was to brainstorm together all possible superfoods to cover the whole alphabet - we agreed that there could be more but at least one for each letter. 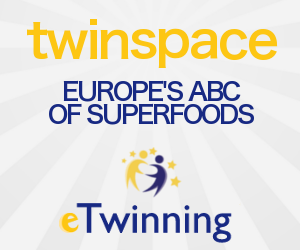 After that, we decided which letters on which superfoods each partner school will work on. At each school small teams were formed and the students started working on presentations, following the recommended and shared instructions and als they began to work on recipes which meant cooking the meal at home, taking a lot of pictures and writing the recipe. This way, we worked as a big international team with tasks assigned. It was a lot of work to be done by the end of February. So, in the following four months, the presentations and recipes were being uploaded in the twinspace and we always dropped a line in the project journal so as our partners were well informed about what had been finished and available. 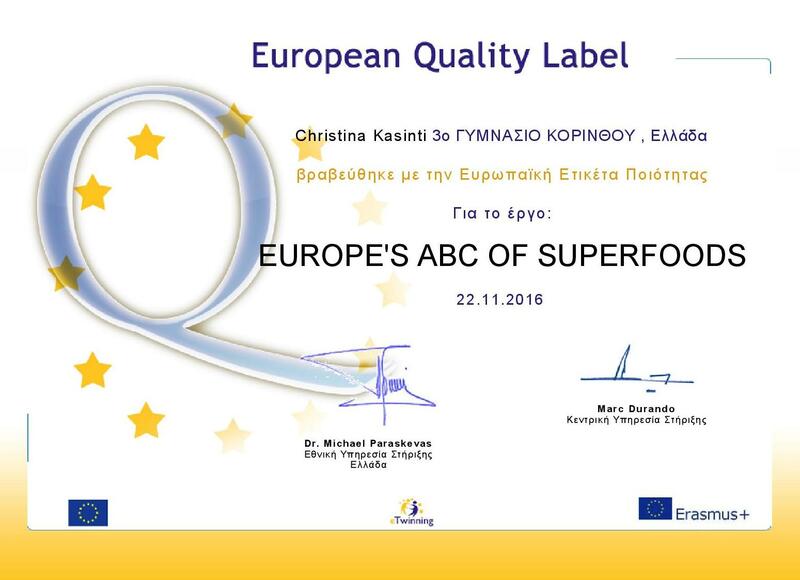 Once we had the list of "our superfoods", we felt like creating collaboratively a GLOSSARY in all the languages of the partners. Also, we wanted to work on the project in more school subjects (not only English even if it was the project language), especially in the fine art classes and so the students at each school created beautiful drawings, paintings, models, ... and we displayed them all in our twinspace. In mid-December, our first LIVE MEETING took place and the students loved the opportunity to see and speak to each other. 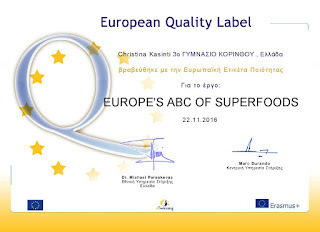 One more thing that successfully took place was an EXCHANGE of typical superfoods - we agreed which superfood would be sent to whom and we realized the exchanges. The students were super-happy when they got the packages, kind of early Christmas gifts, and they cooked the proposed dishes (recipes were included) with them. Of course, before Christmas we exchanged Christmas wishes too. There was also a Christmas present - the Czech team found a series of wonderful youtube videos with songs about fruits and vegetables and they created a set of interactive quizzes in Learningapps to the songs. Uploading the presentations and collecting the recipes continued so that to meet the deadline (the end of February). At the same time, all the teams wanted to contribute with something interesting and exciting looking at the topic from various points of view and that is how an avalanche of presentations and other outcomes began - you can find them on pages Musical superfoods, Poetic superfoods, Superfoods and traditions, Superfoods in the past, Superfoods in cartoons and jokes, Superfoods in science, Strange facts about superfoods, Superfoods and famous people, Superfoods and love, Sound of superfoods, ... many of them had subpages with contributions from several partner schools, many of them included quizzes and tasks for the partners. 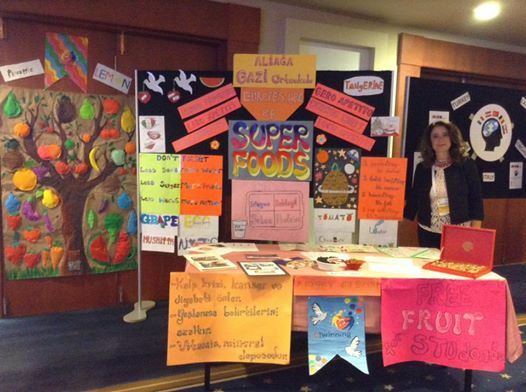 One of the best sub-topic was SUPERFOODS AND GAMES - all partners contributed and in the end there are as many as 35 online games and activities, two of them ("Do you want to be a millionaire" and "Arcade games") created collaboratively by all the partners. Some other activities were really created collaboratively from the scratch, e.g. Superfoods and linguistics (which included a common Book of Similes, Book of idioms and Book of proverbs), Alphabet of superfoods painting gallery, Superfoods for the soul, Common cartoon or Common survey on the students´ eating habits and superfoods. 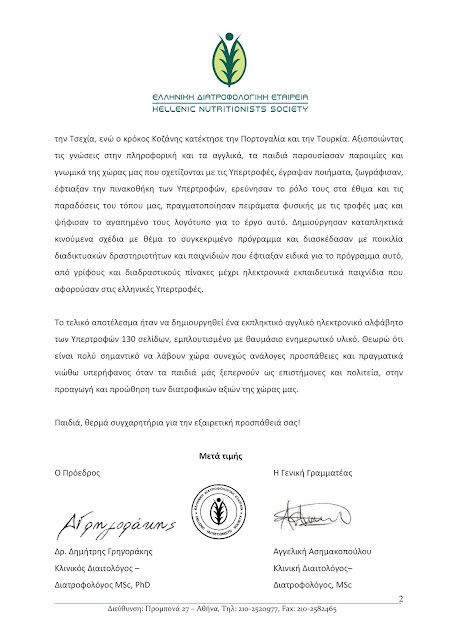 Our project was coming to its final stage: the presentations about superfoods had been finished and as many as 126 recipes had been created and uploaded in the twinspace. 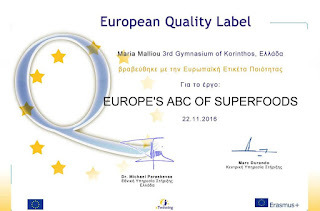 We decided to use the same information from the presentations and choose the best of the recipes and collaboratively create a common Europe´s ABC of superfoods final book, first in the form of Google slides and then transforming it into an Issuu book. 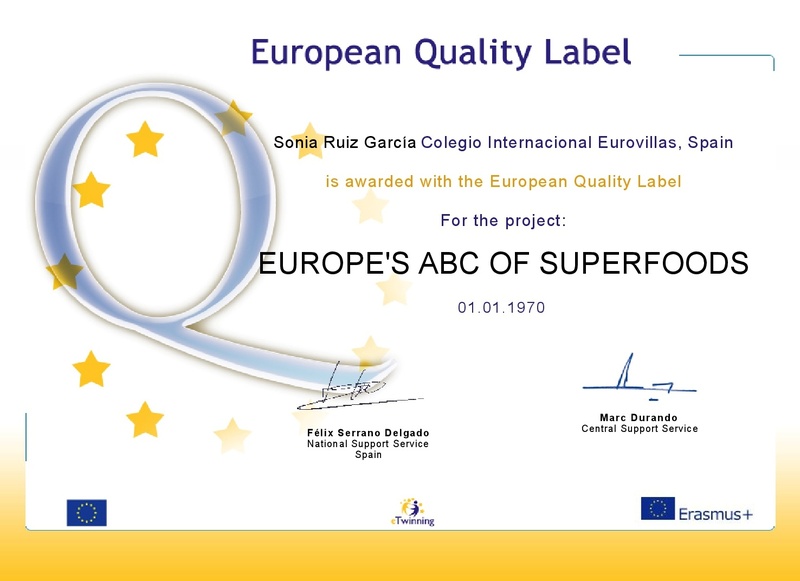 There were three slides for each letter and superfood - one with basic facts about the superfood, one with a recipe and one with information about one of the accompanying activities. 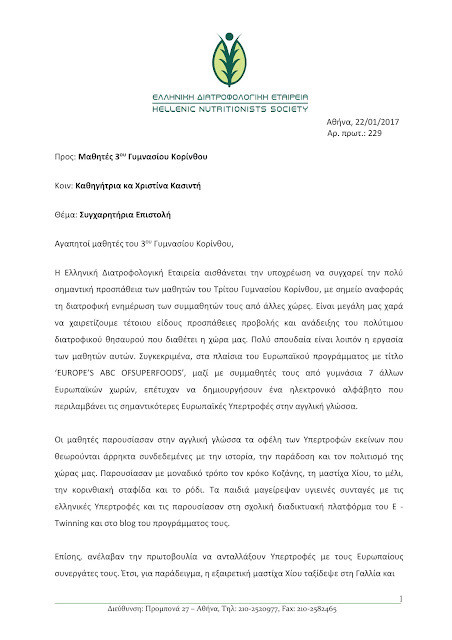 This e-book was our most important common outcome and was sent to several famous chefs - some of them sent us back nice letters with good evaluation and appreciations. At the same time, we wanted to be creative and innovative and agreed on proposing a common superfoods menu which was created by multinational teams.Two and two partner schools collaborated together, took turns in making suggestions, which were discussed thoroughly in classes, we made compromises and in the end agreed on a complete menu which was then cooked and reported about with a lot of pictures. 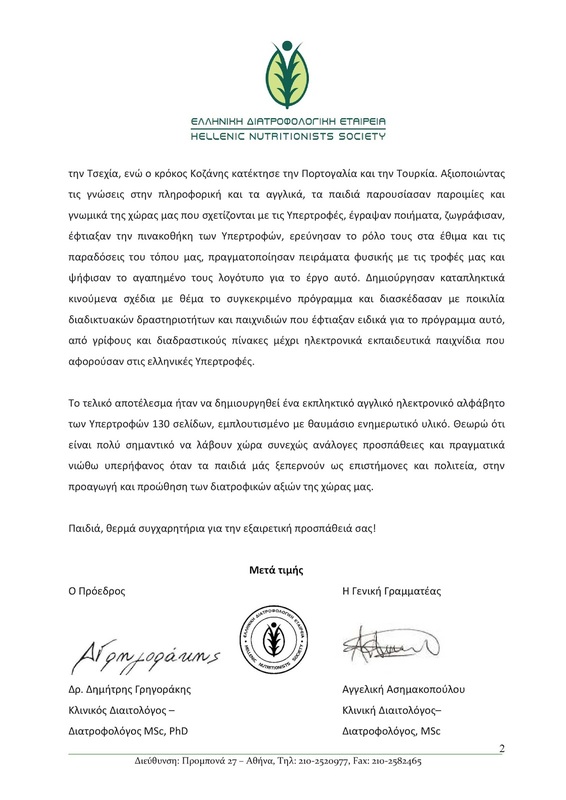 Another highlight of the project´s final stage were “Project Days” which took place in the partner schools - the programme of these days was varied, and included exhibitions, discussions with dieticians, playing games and competitions, … the students learned a lot and also had fun which is the best way how to disseminate the project work. The information about the project days and our project was published in media - in newspapers, on the internet, … At the very end, all the students took an evaluation survey that included not only questions evaluating the project activities, but also suggestion for another eTwinning project which most of the students would like to do next time.